When Jake was 5 years old and standing in the woodshed with a .22 revolver with his Grandad, he had no concept that guns were not part of everyone’s daily life. To him, just like a hammer or a screwdriver, a firearm was just like another tool. In Yakima Washington one of his first paying jobs was hunting sage rats in the local orchards during spring break armed with a bolt action .22 rifle at 11 years old. At 18, Jake received Expert Rifle and Pistol awards in the US Marine Corps. TerryAnn grew up in Lowell Massachusetts where she had never been exposed to firearms. She had only seen firearms on television and in the movie theatres. Armed only with a college education and business experience, she never imagined she would fall in love with the sport of shooting and providing the awareness and understanding of firearms that she never received. From their experience of a young country boy enlightening a strong-willed city girl about firearms, a lack of firearm education was clear. As children entered the scene, again and again, and yet AGAIN, firearm awareness and responsibility became their inspiration. These days, when you see TerryAnn on the Range with her hot pink Glock 19, you would never know that just a short while ago, she had never fired a hand gun. With the knowledge and expertise from their business backgrounds, and with TerryAnn providing insight from the eyes of an actual novice, Manchester Firing Line’s Personal Instructors were handpicked to accommodate the specific needs of a true beginner. 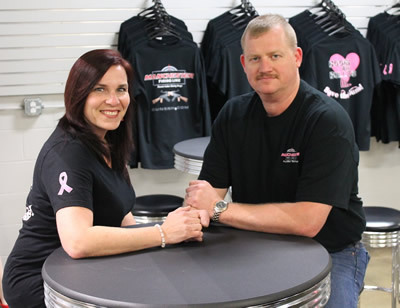 Jake and TerryAnn not only want to offer you the best service, they tried it themselves to be certain it is the best! Although Manchester Firing Line is a fun, family- friendly place to visit and make memories, the true vision is to educate and bring awareness of firearms and the responsibility surrounding the ownership of them. Whichever world you’re from, don’t take our word for it. 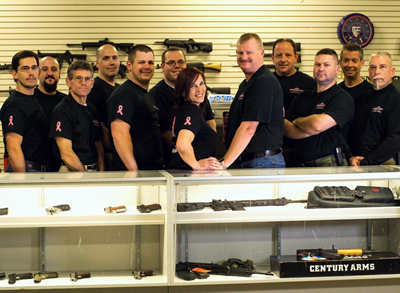 Come get the experience, and leave with an enlightened opinion about firearms. Manchester Firing Line, we are much more than just a place to shoot.